BACKGROUND: Reliable information about the prevalence of hypertension, which is a major contributor to cardiovascular disease in general and to coronary heart disease in particular, in different geographical regions is essential for its prevention and optimal control. In the mining industry, which comprises mainly urbanised black African men, the prevalence, impact, treatment and control of hypertension remains unexplored. METHODS: We conducted a retrospective, descriptive 1-year hypertension prevalence study in Gauteng Harmony Mine Operations in South Africa. Patient profiles and blood pressure (BP) measurements were retrieved from the company electronic data systems. Follow-up entries made at all the different health facilities that serve this population were examined. Continuous variables were summarised using means or medians with standard deviations. Categorical deviations, including ethnicity, were summarised using percentages and/or frequencies. RESULTS: Of the 4 297 subjects (100% of the mining population in the study period), 4 286 (99%) were black Africans; 90% were men; mean age was 44.62 years; and 39.5% (N=1 696) had hypertension, for which 42% (N=719) received pharmacological treatment, of which 31% (13% of the total hypertensive population) achieved an adequate BP control target of <140/90 mmHg. Pharmacological treatment included diuretics (38.5%), angiotensin-converting enzyme inhibitors (30.16%), calcium channel blockers (26%), beta-blockers (4.47%), angiotensin-receptor blockers (0.17%) and centrally acting agents (0.07%), usually taken in combination. CONCLUSION: We confirmed that hypertension is an important health challenge for the mining industry in South Africa. Detection, treatment and adequate control of hypertension should receive high priority from the mining authorities. Hypertension is an important worldwide public health care challenge, owing to its high prevalence and because it is a modifiable risk factor for cardiovascular, cerebrovascular and renal disease.1-3 The total number of adults with hypertension worldwide in 2000 was estimated at 972 million; it has been predicted to be likely to increase by approximately 60% to a total of 1.56 billion by 2025.4 Hypertension is the leading risk factor for mortality and is ranked third as cause of disability-adjusted life years.5 In South Africa cardiovascular disease is the second leading cause of death after HIV/AIDS, with hypertension the predominant contributor to the morbidity and mortality associated with the disease. In persons older than 50 years, systolic blood pressure (SBP) >140 mmHg is considered a greater cardiovascular risk factor than raised diastolic BP (DBP). The risk of cardiovascular disease beginning at 115/75 mmHg doubles with each increment of 20/10 mmHg, and individuals who are normotensive at age 55 have a 90% lifetime risk for developing hypertension.7 The importance of adequate treatment cannot be over-emphasised, e.g. 17 completed randomised controlled trials of BP-lowering drug treatment in a total of 47 000 patients with hypertension recorded 1 360 strokes over a 5-year period.8,9 Overall a net reduction of 5 - 6 mmHg in DBP and 10 - 12 mmHg in SBP achieved a 38% reduction in stroke risk.8 The impact of hypertension on all-cause mortality in a rural Nigerian population assessed by Kautman et al.10 in 1996 found that the risk of death increased by 60% with each increase of 20 mmHg in diastolic pressure. The estimated population attributable risk (the reduction in total mortality that would have been observed if hypertension were not present) was 7%. Hypertension seems to be a more aggressive disease in black patients. Black people are more likely to develop hypertension and, compared with hypertension in other ethnic groups, the disorder is more severe, more resistant to treatment and more likely to be fatal at an early age.12,13This has important implications for the choice of an antihypertensive agent. Many drugs are available for reducing BP, notably thiazide diuretics, angiotensin-converting enzyme inhibitors (ACEIs), angiotensin-receptor blockers (ARBs), beta-blockers (BBs), calcium channel blockers (CCBs), alpha-blockers and direct vasodilators. In a study of predominantly black hypertensive patients conducted more than a decade ago in a predominantly urban population, Seedat14found that black patients responded best to diuretics, vasodilators or CCBs; their response to BB and ACEIs was poor, unless these agents were combined with thiazide diuretics. Current treatment guidelines recommend either thiazide diuretics, CCBs or vasodilators in black patients,15 but it is unknown to what extent these guidelines are being followed. Information regarding the prevalence and absolute burden of hypertension in the mining industry is lacking. We aimed to assess the 12-month prevalence, treatment and control of hypertension in goldminers working at Gauteng Harmony Gold Operations. 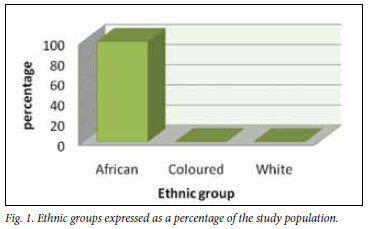 Mining in South Africa is predominantly undertaken by black people, although the numbers of miners from other ethnic groups are increasing. In this setting hypertension is believed to contribute to morbidity and mortality and is a major contributor to absenteeism and decreased productivity. The complications of hypertension are reduced when BP is well controlled. Establishing the burden of hypertension would enable mining authorities to assign sufficient priority and resources to its management and prevention. A literature search of primary and secondary sources provided background information. We undertook a retrospective analysis of the comprehensive electronic database of Harmony Health Centre to establish the 12-month prevalence of hypertension in goldminers at Gauteng Harmony Gold Operations from 1 February 2009 to 31 January 2010. The study population included all goldminers who attended Harmony health centres, which provide free primary health care, occupational services and admissions to hospital for its category 3 - 8 employees. Category 3 - 8 employees, as classified by the Chamber of Mines agreement, are non-officials, most of whom have attained 7 years of schooling, although a minority, especially women, have completed 12 years of schooling. It is compulsory for all goldminers to visit the occupational health centre, where their BP is routinely measured. Comprehensive data were therefore obtained. Most of the miners share the same daily hostel menu and hospital menu when admitted. All the files of patients who attended the occupational health centre during the designated period were retrieved and the data were analysed. 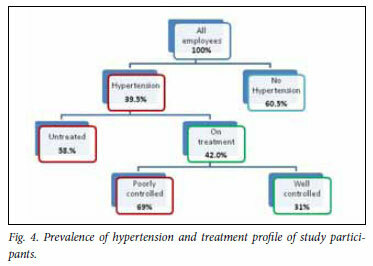 The prevalence of hypertension was obtained from the occupational health centre, and it included all study patients. The study comprised a total of 4 297 patients between the ages of 18 and 69 years. Data included all patients with abnormal BP readings who were therefore referred to the primary health care centre for management. All employees' BP was measured with an electronic BP device. Two readings were taken and their average was recorded. Smoking, exercising or drinking coffee/tea 30 minutes before the BP measurement was not permitted. Hypertension was defined as an SBP of at least 140 mmHg or DBP of at least 90 mmHg, or current use of antihypertensive medication irrespective of the level of BP. Poorly controlled hypertension was defined as BP of >140/90 mmHg. Well-controlled hypertension was defined as BP of <140/90 mmHg on treatment. We collected data electronically and manually. Electronic data were retrieved by an information technology specialist from the Harmony Health systems database and used to establish the prevalence of hypertension. 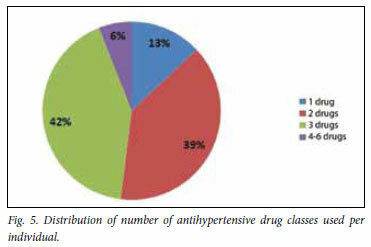 Manual data were collected by the researcher from patient files and used to ascertain which antihypertensive drug classes were used in this population and to determine the percentage of well-controlled and poorly controlled patients by pharmacological drug class category. For the prevalence of hypertension, the entire study population was used as the denominator. The Excel Microsoft Office 2007 computer programme was used for data analysis; it generated tables, graphs, pie diagrams and representation characteristics or values, such as averages and percentages. Permission to obtain the data was obtained from Harmony Health Services authorities and study ethics approval was obtained from the Ethics Committee of the University of Pretoria. Patient confidentiality was maintained throughout the research. A total of 4 297 mine workers attended Harmony health centres during the period February 2009 - January 2010; 99.7% were black Africans, 0.09% were coloured and 0.16% were white (Fig. 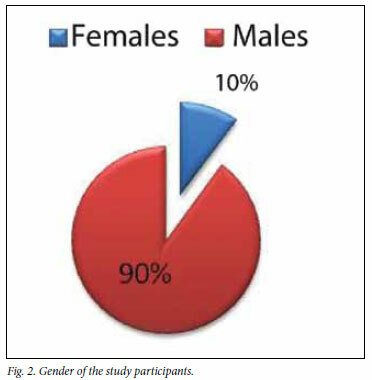 1); 3 866 (90%) were male and 431 (10%) were female (Fig. 2). The majority (69.8%) of the miners were older than 40 years. On average, women (33.27 years) were younger than men (45.89 years). Overall, their education level was low. The overall prevalence of hypertension was 39.5% (N=1 696), with a higher prevalence among males (40.5%) compared with females (29.9%). 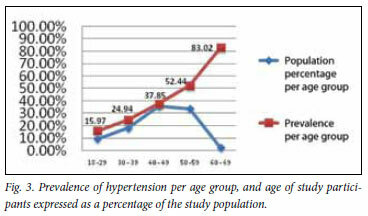 The prevalence of hypertension increased with age, ranging from 15.97% in the 18 - 29-year-old age group to 83.02% in the 60 -69-year-old age group (Fig. 3). Only 42% (N=719) of patients diagnosed with hypertension received pharmacological treatment for this condition (Fig. 4). In the hypertensive group taking medication, 13.35% (N = 96) were on monotherapy, while 86.65% (N=623) were taking two or more antihypertensive agents. Only 31% (N=223) reached their target level of BP control on treatment; 18% of these received monotherapy and 82% combination antihypertensive drug therapies. Despite pharmacological treatment, 69% of patients were poorly controlled. Of these, 11% were on monotherapy and 89% were taking multiple antihypertensive agents. 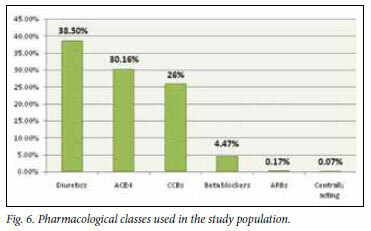 When the number of drug classes used per individual was assessed, 13% of patients were treated with 1 drug class, 39% with 2 drug classes, 42% with 3 drug classes and 6% with 4+ drug classes (Fig. 5). Pharmacological interventions in descending order included diuretics (38.5%), ACEIs (30.16%), CCBs (26%), BBs (4.47%), ARBs (0.17%) and centrally acting agents (0.07%) (Fig. 6). The large study population comprised predominantly black middleaged men who were experienced goldminers of low education, and presumably fit, in an urban setting. This provided a unique study population that to our knowledge has not been studied previously. The prevalence of hypertension in this population was 39.5% which is at the upper end of the range (15 - 59%) of previously reported studies in black patients that included men and women.16,17The worldwide overall prevalence of hypertension is 26.8%. The prevalence of hypertension in the South African Heart of Soweto Study was 56%,16 in which the majority of the participants were urbanised and female, and possibly not as physically fit as our study population. This may impact on the differences seen in the prevalence of hypertension. Only 42% of hypertensive patients in our study received antihypertensive treatment. This underlines the point that although the screening methods and detection of hypertension were excellent, 58% of patients received no pharmacological therapy for this potentially lethal condition. Of greater concern is that only 31% (N=223) of hypertensive patients on therapy, representing 13% of the total hypertensive study population, achieved an optimal BP control of <140/90 mmHg. This is an improvement on the 3.9% quoted by Li et al.,6but remains far short of the recommendation that 50% of people with hypertension should attain proper BP control on treatment. This poor figure possibly reflects inadequate monitoring tools, lack of knowledge about hypertension, poor adherence to therapy and low levels of education among the employees. It may also reflect a gap in effective health programmes in the company. More could be done to control hypertension and thereby limit its complications. The high use of diuretics, ACEIs and CCBs and low use of BBs is reassuring, as this is in line with hypertension treatment guidelines found in the 7th Report of the Joint National Committee on Prevention, Detection, Evaluation and Treatment of High Blood Pressure (JNC-7) and international hypertension guidelines.15Yet the most recent National Institute for Health and Clinical Excellence (NICE) guidelines advise against the use of ACEIs in black patients, and recommend that ARBs be used instead, as second-line agents in combination with the first-line CCBs. Thiazide diuretics are recommended after the combination of CCBs and ARBs has failed, or in some instances as first-line therapy when CCBs are contraindicated.18 Prescribing practices in the mining population must be re-evaluated in this context. Approximately two-thirds of hypertensive patients cannot be controlled on one drug alone, and will require two or more drugs from different classes.19,20 In the ALLHAT study, 60% of those whose BP was controlled to target (<140/90 mmHg) received two or more antihypertensive agents. Only 30% were controlled on one drug.19 In our study in predominantly black patients, 18.4% were controlled on monotherapy, which was low in comparison to the ALLHAT study. Furthermore, in our study 45.7% were controlled on two drugs while 35.9% of those controlled required three or more drugs, reflecting the difficulty in effectively treating hypertension in black patients. Of note is that miners are not allowed underground if their BP is not adequately controlled. We did not examine non-pharmacological means of BP control. Lifestyle interventions such as restricting salt intake, reducing body weight and limiting alcohol, tobacco and caffeine use decrease BP and improve antihypertensive drug efficacy. Other important lifestyle measures include a low-fat, high-fibre diet and regular moderateintensity exercise.18,21 Although the miners had access to dieticians, it is not known whether dietary advice was followed or whether other lifestyle modifications were implemented. This is an important area for additional research. The study also failed to elucidate other potential causes of uncontrolled BP, e.g. poor adherence to treatment because of long duration of therapy, complicated regimens, side-effects of drugs, misunderstanding instructions and the asymptomatic nature of hypertension, among others.18,21The South African guidelines for the treatment of hypertension emphasise this point succinctly.21Further studies are also required to assess interventions to support adherence. Despite these limitations, the study presents information on the prevalence, treatment and control of hypertension in Harmony North Operations, which is unusual in South Africa as it has excellent screening and medical facilities. Hypertension is a 'silent killer' affecting millions of people worldwide despite advances in its diagnosis and treatment. This study confirms the high prevalence of hypertension in a largely black mining population and provides first-time analysis of its prevalence, treatment and control in this setting. These findings highlight the urgent need to implement cost-effective strategies, targeting individuals and health care providers to prevent hypertension and improve treatment and BP control in this population. Acknowledgements. Mr Werner van Zyl (IT specialist), Harmony Health Service Authorities and the mine patients.